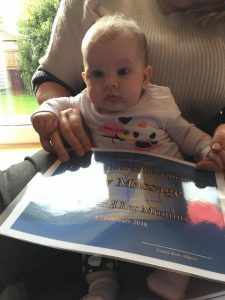 What happens when the Baby Massage classes come to an end? 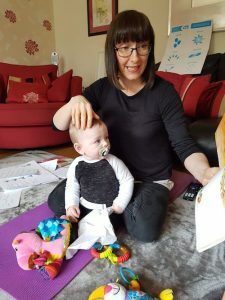 Occupational Therapist and Baby Massage Instructor, Tracey Allport, owner of MOTH Therapies, has introduced the perfect follow-on with Baby Story Massage Classes. We were so impressed by Tracey’s enthusiasm and innovative ideas since doing our Story Massage training, that we recently presented her with our Best Practice Award. We asked Tracey (pictured below) to tell us more …. Who attends your Baby Story Massage Classes? My classes are follow-on groups after a standard course of five baby massage sessions. I have run them over 5 weeks but the mums want them to keep going, so I will now be running them over 6 weeks and offering extra sessions in school holiday times. This will also allow for siblings to attend, as Mums say they are desperate to be involved. 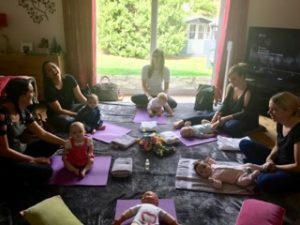 Mums are using Story Massage with all of their children, after learning the techniques with their babies. One of the joys of Story Massage is that it is suitable for all of the family to use together. The Baby Story Massage groups are timed to run in between a nap and before a feed, in the mornings and the afternoons, so they are all alert and ready for action. They engage so much more when they are wide awake. 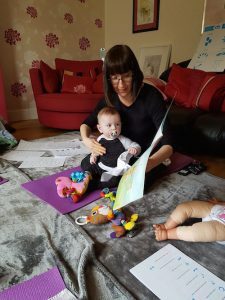 At the moment it has been Mums and babies attending, but as I have held successful traditional baby massage groups with Dads, I will run some groups specifically teaching them Story Massage too. That way Dads have a fun, beneficial and interactive activity to use with their child as they grow. I feel it is so important for Dads to be empowered in their child’s care and development. What are the benefits for Mums and Babies? The Baby Story Massage classes provide extra tools and strategies to use with babies and toddlers. Mums appreciate being able to do the moves at home in a functional way, as a part of their routine or to help with daily activities such as getting dressed. 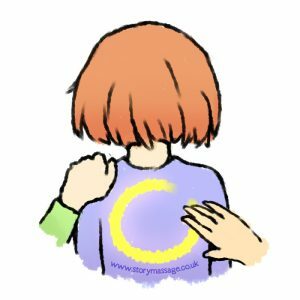 Story Massage is a simple and flexible programme. No oil is used so you don’t need to take off any clothes, and no preparation or extra resources are needed. The strokes are really easy to learn and to remember too. 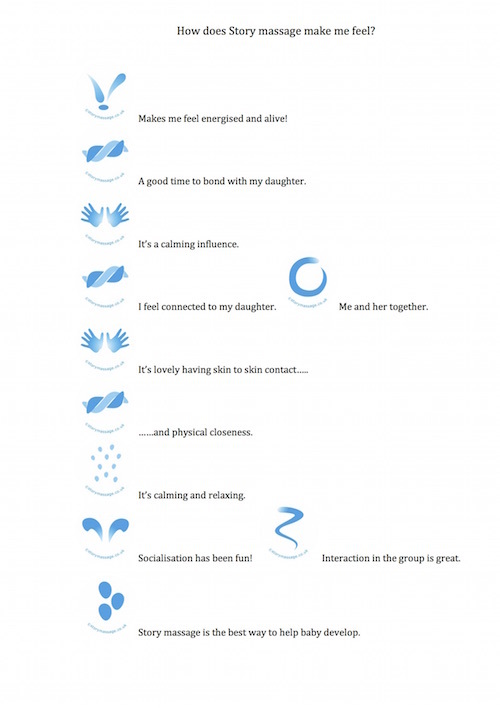 This is so helpful and empowering for busy parents of small babies. You can massage any part of the baby that can be easily accessed which is great for babies who don’t like to stay still for too long. So while one Mum is massaging the tummy, another might be massaging her baby’s back, arms or feet, whichever feels best. Babies could be sitting up, lying down or sitting on Mum’s lap. Mums love that the activity is baby led, but they also feel in control; doing something fun and meaningful for their baby. Mums know that they are helping their baby’s development. Mums comment that they love learning the traditional rhymes and songs such as Jack and Jill and Horsey, Horsey, which are often new to them. It helps keep traditional songs alive! I have noticed that parents become more confident singing and engaging with baby as they learn the words and tune. Babies are really tired and settled at the end of the session, and some fall asleep. They need to give extra focus to their attention and concentration, and their sensory, auditory, visual, endocrine, musical-skeletal and nervous systems are all engaged. How do your structure your classes? Each session lasts an hour. The cost is £50 for 5 weeks, but due to popular demand, Mums have asked for the course to run for 6 weeks and extra sessions in holiday time. I charge £10 for add on classes. Baby Story Massage Groups with Mums and babies are held with 3 to 8 attendees, to ensure maximum attention and facilitate building of friendships. In the first session we look at the benefits of Story Massage and the ten Story Massage strokes. This gives an overall feel for Story Massage. Then I demonstrate three to four strokes using the Story Massage book and posters as visual aids. Mums start with a few standard baby massage moves (learnt in previous weeks) to warm their babies and get them used to being in the group. And then we continue with Story Massage with the babies unclothed as the Mums and babies are familiar with this. It is the same format for each week, gradually introducing the different strokes. Each week has a theme such as food, animals, people, weather and I devise at least three different massage stories on the theme. We repeat these at least three times. This allows for repetition which aids baby’s communication and anticipation. It also helps Mums to learn the songs/rhymes. At the end of each session, I use my doll to demonstrate how Story Massage can be used through clothes and how strokes can be set to lines of a story book. 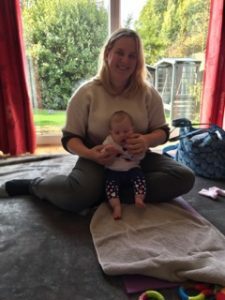 At a recent session, a mum asked if I could demonstrate on her baby instead of the doll! 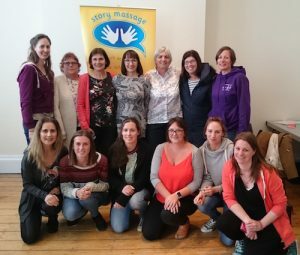 As the course progresses, we take the opportunity to share a massage story with each other and create one as a group, which is always a lovely bonding experience and especially helpful for Mums to see how they can use Story Massage at home and feel what is is like to be given a massage too. We even have a try at improvisation with songs from You Tube! Mums have copies of the stories to take home and an opportunity to loan a Story book, incorporating the massage strokes. 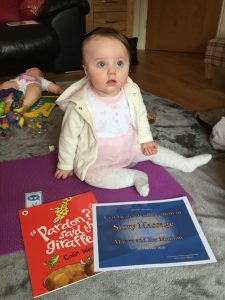 Mums are given a certificate of attendance, bookmark and stickers with a book to create their own Story Massage book for their babies. Which massage stories have been most popular? 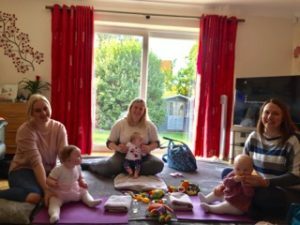 There is a lot of planning that goes into each session but it was so worth it, to see Mums engaging with their babies and growing in confidence. 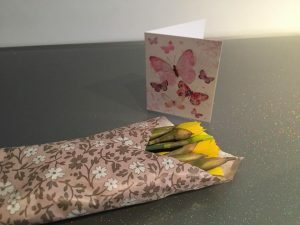 And the babies have such a look of delight on their faces throughout the session, but particularly when we read a story at the end; it brightens my day too!One Mum even sent me some flowers to say how much she had enjoyed the Baby Story Massage sessions. 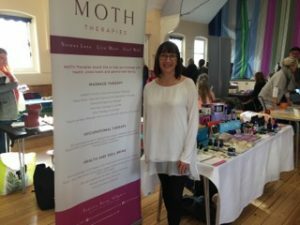 So what is next for MOTH Therapies Story Massage? 2018 has been an exciting year for me. 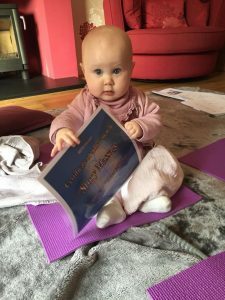 My bespoke studio is almost completed and apart from expanding my baby groups to crawlers and toddlers, I will offer groups for school age children, incorporating Story Massage with Mindfulness techniques. I am so passionate about positive touch and its benefits for all ages. We live in such a fast paced and stressful age, I would love for children to have tools to help them with their emotional regulation as they grow. I will be hosting Parent specific half day workshops to teach the benefits of Story Massage, directly to parents, who are unable to attend weekly groups. Specific Baby Story Massage workshops for Dads are planned to start in April. I would love to be able to use my skills with SEN children and also adults with dementia. MOTH Therapies focuses on reducing stress and improving quality of life, through the full cycle of life and I believe that Story Massage is an exceptional tool, to be able to fulfil my ethos. Are you inspired by the way that Tracey has developed Baby Story Massage classes? Would you like to train to use Story Massage in your work or home? We run a one day accredited training course held around the country for individuals and groups. These days can also be organised as in-house training sessions. And we also have a new online training option.